Super compact and lightweight series!! Fit into all car boots. Soma is an established brand in the market and is the affordable cousin of KARMA wheelchair. Be assured of its durability when you purchase a SOMA from us. From our experience renting and using wheelchairs for ourselves, we conclude that SOMA wheelchairs are the lightest, most durable and the best quality. There are many other cheaper and even more expensive made-in-China wheelchairs. After 1 month of using them, they will have wheel and braking problems. SOMA is the affordable cousin of KARMA and is made in Taiwan. However most KARMA wheelchairs sell for 3x the price and only offers additional cushion as the added value. Cushions are cheap and can be bought at $2 shops such as Daiso. Be assured of the quality when you purchase SOMA. 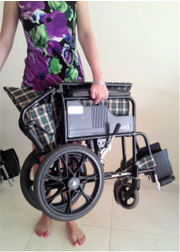 Don't shortchange yourself by buying an inferior made-in-China wheelchairs that does not lasts long.